Product #18717 | SKU LP36725 | 0.0 (no ratings yet) Thanks for your rating! 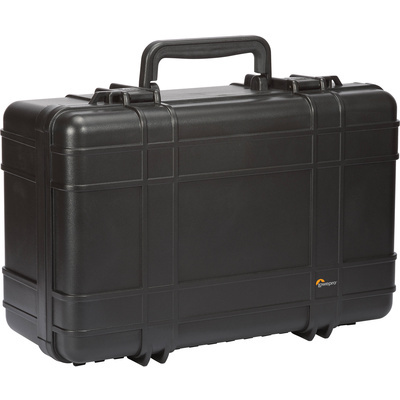 Carry and protect your pro DSLR and attached 70-200mm f/2.8 lens with this black Lowepro Hardside 400 Photo Waterproof Hard Case, which features a removable backpack with tuck-away shoulder straps. It also fits 6-8 extra lenses or flash units. The Hardside features an IP67 waterproof rating and a durable ABS plastic polymer shell with integrated release valves in the latches. The interior backpack insert is made from 420D and 210D nylon, and offers an organisation pocket and padded dividers for arranging your gear. Additionally, the Hardside's stackable form factor makes for convenient storage and transport. A sturdy grip handle offers an easy carrying option. Accommodates pro DSLR and attached 70-200mm f/2.8 lens, plus 6-8 extra lenses or flash units. Features a removable backpack with tuck-away straps. IP67 waterproof rating for reliable gear protection, even when submerged up to 1m for up to 30 min. Keep equipment safe from debris and moisture inside the airtight case with a durable silicone gasket and seal. Durable ABS polymer shell for a high level of impact protection. Integrated release valves in the latches for easy opening in low and high altitudes. Interior backpack insert made from 420D and 210D nylon. Organisation pocket and adjustable, padded dividers in backpack insert for arranging your gear, including accessories. Stackable form factor makes for convenient storage and transport. Full-length hinge on back of case. Sturdy grip handle offers an easy carrying option.